Bill Hosket will serve as the Honorary Chairperson for this inaugural event and will address the group during dinner. 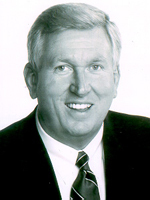 Bill Hosket Jr., was captain and MVP of the 1968 Ohio State team which won the Big Ten title in a playoff and then went on to finish third at the NCAA championships by beating an Elvin Hayes-led Houston squad in the consolation game. Hosket averaged 20.1 points and 11.4 rebounds as a senior, leading the Buckeyes to a 21-8 record. He was an All-Big Ten pick at forward that year. As a junior, the 6-foot-8-inch Hosket, whose father, Bill Sr., also played for Ohio State, was an All-Big Ten choice at center, averaging 19.6 points and 12.6 rebounds. Hosket was a three-year starter for the Buckeyes, leading OSU in rebounding and scoring all three of those years and pacing the team in field goal percentage as a sophomore and junior. He scored 1,441 points in 74 games, a total that places him 17th on the OSU career scoring list. He also pulled down 910 rebounds, the fourth highest total in Ohio State history, and averaged 12.3 rebounds per game, a figure that is second only to Jerry Lucas 17.2 average. Hosket was selected to the 1968 Olympic team and then played with the New York Knicks. He also has the distinction of being Ohio States first Academic All-American in basketball.